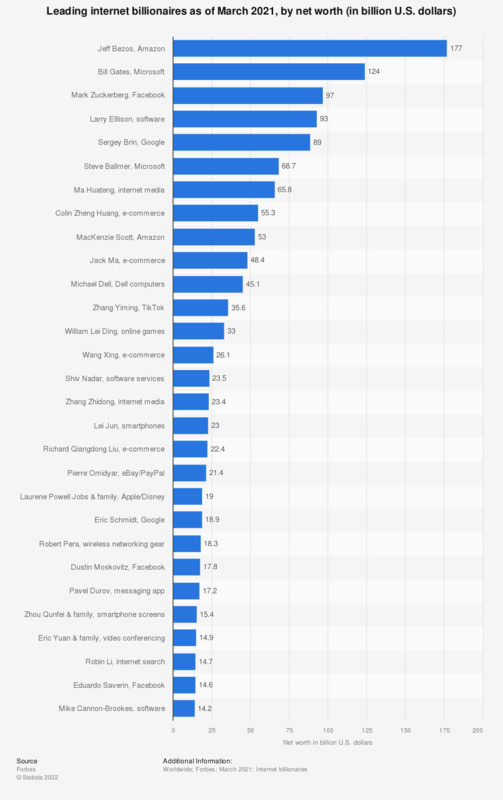 This statistic gives information on the net worth of the richest billionaires who have earned their fortune in the internet business as of March 2018. During the survey, Amazon founder Jeff Bezos ranked first with a personal net worth of 112 billion U.S. dollars. Facebook founder Mark Zuckerberg was ranked second with 71 billion U.S. dollars. Both Bezos and Zuckerberg are also featured in the top 15 richest Americans of 2018. * Billionaires who earned their fortune in the internet business. Data is based on the Forbes Billionaires: Technology ranking.